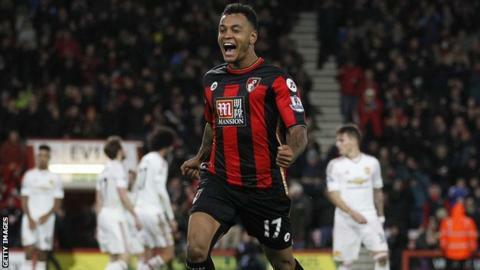 Manchester United lost ground at the top of the table as their former striker Joshua King scored the winner in Bournemouth's 2-1 triumph - the Cherries' second shock win in a week. After David de Gea was beaten direct from a corner by Junior Stanislas, United equalised via Marouane Fellaini. The visitors faded after the break and could not fight back after King fired in from Matt Ritchie's set-piece. United will slip to fifth if Tottenham beat Newcastle on Sunday. The scoreline and final few minutes could have been more comfortable for the hosts, but substitute Glenn Murray squandered two excellent chances to put Bournemouth further out of reach. Bournemouth are up to 14th in the Premier League on the back of successive victories, having beaten defending champions Chelsea last weekend. United boss Louis van Gaal bemoaned his options in attack last week, claiming that Barcelona's Luis Suarez or Manchester City's Sergio Aguero would convert the chances his strikers were missing. It is difficult to imagine either player squandering the two fine openings that Anthony Martial - now without a goal in nine Premier League games - created for himself. But United were lacking in plenty of other areas. Anthony Martial scored two goals when playing deeper in his first full Premier League game - September's 3-2 win over Southampton - than against Bournemouth (shown in the touchmaps on the right and left respectively). Daley Blind, the experienced head in a fresh-faced defence, was caught horribly out of position to allow Murray in on goal, the midfield created little and the team as a whole were out-fought by a spirited Cherries' side. When Fellaini trudged off to be replaced by Nick Powell in the 74th minute, their best hope of a point went with him. Bournemouth's victory at Stamford Bridge seven days ago was akin to a smash-and-grab raid based on 37% of possession, a sturdy defence and a well-executed set-piece. But against United they were a constant danger on the counter with the pacey, intelligent runs of Stanislas off the wing posing a particular threat. After his swirling delivery had caught out De Gea, Stanislas ran clean through, only for the United goalkeeper to make partial amends as he smothered at his feet. Bournemouth became only the second side to beat Chelsea and Manchester United in successive Premier League games. Everton also managed to do so in February 2010. King, who made two substitute appearances for United during his three and a half years at the club, had looked less assured in the Cherries attack, but guided in an awkward half-volley as a rehearsed corner routine came off for the hosts. As the home fans constantly reminded their United counterparts, Bournemouth "come from League Two". They came dangerously close to slipping even further down the divisions in the 2008-09 season as they successfully fought administration and relegation to the Conference. At the same time United were lifting a third successive Premier League title under the guidance of Sir Alex Ferguson. United chief executive Ed Woodward, who watched on stony-faced in the Vitality Stadium stands, will not enjoy the contrast in fortunes now. Bournemouth midfielder Harry Arter played for 86 minutes just a few days after he and his partner's child died at birth. "It's been a really tough week for Harry and his family, hugely emotional," said Bournemouth boss Eddie Howe. "He's handled himself with real dignity and to play the way he did, I can't credit him enough. He showed great strength. "Harry wanted to play, I had to make an assessment of him but once I'd spoken to him there was no doubt I was going to play him." Bournemouth manager Eddie Howe: "We try not to focus on the injuries we've had. "We still believe we're strong enough. Hopefully the last few games is the proof. "We've looked at the last few games as turning points - we're looking at this run as hopefully something of a start for us." Manchester United manager Louis van Gaal: "The attitude of the players I liked. But that is not the only important thing - you have to perform in a certain way. "It is always very disappointing when you are at the top of the table when you lose to a club at the bottom of the table." "We're an institution - we stick by our managers"
Manchester United fan Stephen called BBC 606 to defend the tenure of manager Louis van Gaal. Manchester United's starting line-up was their sixth youngest in Premier League history (an average of 24 years 131 days) and their youngest since May 2014 v Hull (24 years 82 days). Junior Stanislas has scored three goals in his last two home games and been involved in four goals in his last four Premier League appearances (three goals, one assist). Stanislas' opening goal was the third fastest goal this season (one minute 40 seconds) - the fastest goal was scored by Bournemouth team-mate Matt Ritchie against Tottenham after 49 seconds. Manchester United conceded two goals from corner situations in a single game for the first time since January 2014 v Chelsea. It was Manchester United's 13th defeat against a newly promoted side in the Premier League, their first since losing 5-3 to Leicester last season. Bournemouth will play West Brom, currently one place above them, away next Saturday. Manchester United meet Norwich at home on the same day, before a Boxing Day trip to Stoke and a home match against Chelsea on 28 December. Match ends, Bournemouth 2, Manchester United 1. Second Half ends, Bournemouth 2, Manchester United 1. Artur Boruc (Bournemouth) is shown the yellow card. Offside, Manchester United. David de Gea tries a through ball, but Juan Mata is caught offside. Glenn Murray (Bournemouth) wins a free kick in the defensive half. Substitution, Manchester United. Phil Jones replaces Patrick McNair. Substitution, Bournemouth. Eunan O'Kane replaces Harry Arter. Harry Arter (Bournemouth) is shown the yellow card. Delay in match Andrew Surman (Bournemouth) because of an injury. Attempt missed. Harry Arter (Bournemouth) left footed shot from outside the box misses to the left. Assisted by Dan Gosling. Patrick McNair (Manchester United) wins a free kick in the defensive half. Foul by Glenn Murray (Bournemouth). Attempt missed. Anthony Martial (Manchester United) left footed shot from the centre of the box is high and wide to the left. Attempt blocked. Michael Carrick (Manchester United) right footed shot from outside the box is blocked. Substitution, Manchester United. Nick Powell replaces Marouane Fellaini. Attempt missed. Glenn Murray (Bournemouth) left footed shot from the centre of the box is too high following a corner. Corner, Bournemouth. Conceded by Guillermo Varela. Attempt missed. Glenn Murray (Bournemouth) left footed shot from the centre of the box is too high. Assisted by Dan Gosling. Foul by Cameron Borthwick-Jackson (Manchester United). Guillermo Varela (Manchester United) wins a free kick in the defensive half. Substitution, Bournemouth. Glenn Murray replaces Joshua King because of an injury. Marouane Fellaini (Manchester United) wins a free kick in the defensive half. Attempt blocked. Marouane Fellaini (Manchester United) left footed shot from the centre of the box is blocked. Corner, Manchester United. Conceded by Artur Boruc.